April is a great month. Not only does the weather start to change for the better throughout much of the United States, but it’s also financial literacy month! Financial literacy month is dedicated to helping raise awareness about important financial matters. 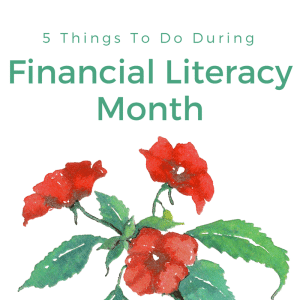 Instead of digging deep into an individual topic I thought it would be great to talk about five ways you can celebrate financial literacy month, no matter where you are in your personal finance journey. Creating a budget is a great first step in any financial plan. If you don’t know how much money you have coming in and going out you won’t be able to appropriately plan for the rest of your financial goals. Luckily, making a budget isn’t all that complicated either. I think we all know how easy it is to get into debt. It’s getting out of debt that’s hard. Whether you’ve racked up a big student loan bill or mountains of credit card debt there is a way out. Debt does not have to be forever. It’s going to take hard work on your part but in the end, being debt free will be completely worth it. If you already have your budget and financial goals mapped out, why not spend some time getting organized? Create filing systems, go through last year’s tax documents, fix budget leaks and create financial organization that works for you. Having income outside of your day job is a great way to not only diversify, but to accelerate your financial goals. Plus, side hustles are fun. You get to pick what you want to do and try and earn extra money from it! Your credit history and score can change from month to month. But what if your credit report is wrong? What if there is an error – or even worse, what if your credit information was stolen in one of the recent hacking attacks on retail companies? That’s why you need to check your credit at least once a year, and Financial Literacy Month is a great time to do it. You can check out Discover’s Credit Resource Center to answer your questions about applying for a credit card, saving with a balance transfer, credit scores and online safety, plus so much more! Anyone, whether they have a Discover card or not, can access these materials. One of the most informative areas of the site is the New to Credit section, which outlines answers to common questions about managing credit and includes sections for students and for parents. This is a great resource for anyone interested in learning more about credit. Financial literacy month is a great time of year for you to take a good look at your finances and make changes where needed. If you’re new to personal finance this is the perfect time for you to jump in and get started on your own financial plan. If you’re a personal finance veteran there is still plenty you can do to optimize your own financial situation and help raise awareness. I am a paid brand Blogger for Discover Products Inc. but my views are my own and do not necessarily reflect the views of Discover Products Inc. and its affiliates.